The Trillion Dollar Shift – Achieving the Sustainable Development Goals: Business for Good is Good Business. Over the past 30 years, the world has seen great social improvements. Technology has been developing at an enormous pace and is helping to solve our most pressing social and environmental challenges. Yet, despite this success, our current model of development is still deeply problematic. Natural disasters triggered by climate change have doubled since the 1980s, violence and armed conflict now cost more than 13 percent of GDP, social inequality and youth unemployment is worsening around the world, and climate change threatens the global population with tremendous environmental as well as social problems. Using the United Nations Sustainable Development Goals as a framework, this book sets out how business and capital now have a real opportunity to help resolve these problems. Businesses are often accused of greenwash’ or bluewash’. 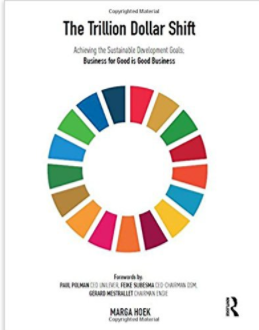 With clear and plentiful examples and cases of how businesses are making a difference, profiles of the SDG pioneers, and the relevant facts and figures to support the cases, this highly readable book is a must-read for businesses (large and small) that wish to genuinely support the delivery of the SDGs. The Paris Climate Agreement and the Sustainable Development Goals (SDGs) drive change and offer a narrative and an opportunity to all to speak in one language on sustainability. They provide us with a clear set of targets for 2030. Through following the SDGs, opportunities abound for business and capital to unlock markets which offer endless potential for profit while at the same time working towards the Sustainable Development Goals. This book illustrates for business how to make the much-needed Trillion Dollar Shift. The book can be downloaded for free here but a hard copy is a must have! Hey Buddy!, I found this information for you: "The Trillion Dollar Shift – Achieving the Sustainable Development Goals: Business for Good is Good Business.". Here is the website link: https://www.duurzaam-ondernemen.nl/boek/the-trillion-dollar-shift/. Thank you.